Incheon International Airport is a station on Airport Express of the Seoul Subway. For more details view the Explore Seoul interactive Subway map centered on this station. 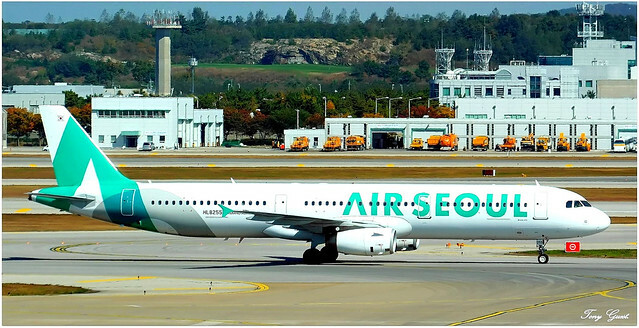 HL8255 | Airbus A321-231 | Air Seoul. B-8869 | Airbus A321-211 (WL) | China Southern. 9V-SWG | Boeing B777-312ER | Singapore Airlines. HL7641 | Airbus A380-8 | ASIANA. 9M-MNB | Airbus A380-8 | Malaysian. HL7569 | Boeing B737-900 | Korean Air. HL8265 | Airbus A321-321 | ASIANA. HL7754 | Airbus A330-323 | ASIANA. HL8024 | Boeing 737-8HX (WL) | T'Way. HL8084 | Boeing 787-9 Dreamliner | Korean Air. HL8293 | Airbus A330-323 | ASIANA. N454PA | Boeing 747-47N(F) | Polar Air Cargo. HS-XTA | Airbus A330-343 | Thai Air Asia X.
B-2337 | Airbus A320-214 | China Eastern. VN-A640 | Airbus A321-211 (SL) | VietJet Air. HL8052 | Boeing 737-8 (WL) | EASTAR+JET.